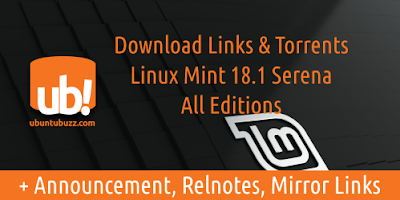 This list shows download links for all four editions of Linux Mint 18.1 "Serena" GNU/Linux operating system. Linux Mint Serena is a LTS version that will be supported until 2021. This list provides regular and torrent ISO download links, including official announcements, release notes, mirrors, and documentation links for 4 editions of Serena (Cinnamon, MATE, XFCE, and KDE). I hope this short list will be helpful for you all. Enjoy! For any beginner reading this article, this is a list of links to download the ISO of Linux Mint operating system newest release, 18.1 Serena. To use Linux Mint operating system, download any of 4 editions below and burn the ISO to a USB drive, then install it to your computer. You can download all ISO files at no cost. Torrent links are highly recommended because by downloading using torrent, you decrease the giant load at Linux Mint developer's server thus helping the whole community. If you want to help Linux Mint development more, you can donate money to Linux Mint.